The posh shopping district of Ginza is not immune to trying to lure people in with Christmas Lights in order to get people to spend more money. Ginza’s most famous Christmas display is the annual Mikimoto Christmas Tree. Every year people wonder what the tree will look like and for the past couple of years they have kept things traditional. They have simple red and white lights as well as ornaments. This year they added a string of white glowing ornaments that say “Merry Christmas” on it. You can see a smaller version at their second shop just behind the Printemps department store. On the main strip, Chuo-dori, they are having their Hikarimichi Illumination. Simply put, they are putting thousands of LEDs to line Chuo-dori and to some extent Harumi-dori to make it into an illuminated carpet. It looks great but like any other display where they don’t make any variations, once you see one block, you have seen most of it. 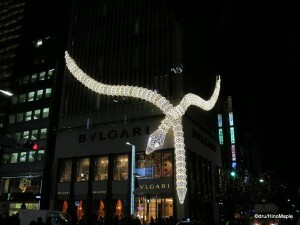 Last year they had artistic angels that were great and I wanted to walk up and down Chuo-dori just to see all of them. This year, unfortunately, I don’t have the urge to see many of the lights in Ginza. Thankfully a few of the shops have decided to install lights onto their buildings. Cartier has reinstalled a red ribbon of light to make their gold building look like a Christmas Gift and Bvlgari has installed a large shimmering bracelet onto their building. It is quite stunning to look at and very well done. I was really impressed by it. Not to be left out, Sony has installed “Crystal Aqua Trees” which is a set of columns that flicker with music. Lastly, a walk through Ginza is not complete without a quick walk through Yurakucho. 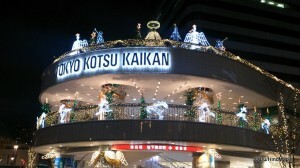 The Tokyo Kotsu Kaikan building next to the Marui department store is very well lit up with reindeer and angels. Then there is the Open the Cork illumination at the Lumine and Hankyu department stores. They have a few “chandeliers” made of champagne glasses that are lit up in a yellow hue. It is nice and the fact they held a special party with free champagne to kick off the lighting event was even better. Unfortunately I couldn’t stay for the champagne as I had to work. Hopefully I will be able to do it next year. This entry was posted in Christmas, Tokyo and tagged bvlgari, cartier, Christmas, Christmas Illumination, Christmas Lights, Christmas Tree, chuo-dori, Ginza, harumi-dori, Hikarimichi, Hikarimichi Illumination, japan, Mikimoto, tokyo, Tokyo Kotsu Kaikan, tree, Yurakucho by Dru. Bookmark the permalink. If you are still here, check out Tokyo Station at night. I’ll be there on the 26th and will update things of course.